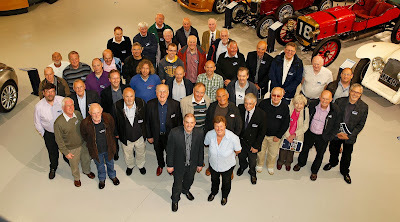 This is our first blog, intended to keep you informed and up to date on what the volunteers are up to at the Heritage Motor Centre (HMC). Firstly, let’s kick off by telling you why we’ve been recruited and who we are. The HMC has over 270 vehicles in its collection at Gaydon, yet currently only has space to display around 170 of them in the main museum. However, plans are now well advanced to build a new Museum Collections Centre adjacent to the existing site – completion hopefully being towards the end of 2014. The new Collections Centre will be a working museum where the public will be able to view the repair and restoration of vehicles as they occur. All of the reserve collection of vehicles, in their current good or bad state of repair, will be housed in the museum for public display. And this is where the volunteers come in. We have already surveyed the condition of all the vehicles in the HMC collection and created photographic records of their current state. We are now in the process of acquiring full technical details of each vehicle as well. Another project has been conducting interviews with people who have worked in the British motor industry in order to compile an audio history. Alongside these activities we have also been let loose on some interesting and diverse restoration projects – more details of which will be described in forthcoming blogs. Other duties include manning the HMC stand at the NEC Classic Car Show and when the Collections Centre opens we will also be involved as tour guides.